My Pool Cleaner Is Stuck, What Can I Do? Many robot owners are telling me their pool cleaner is stuck on the main drain grate. I discussed this problem with Aqua Quality Pools and Spas, Inc. They have two fixes. The first is a Grate cover by Polaris. 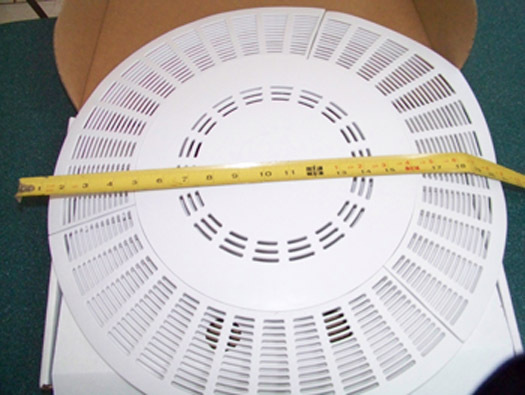 Stainless screws attach 3 rubber flanges to a center cap creating a 20 inch diameter grate cover with a low profile. 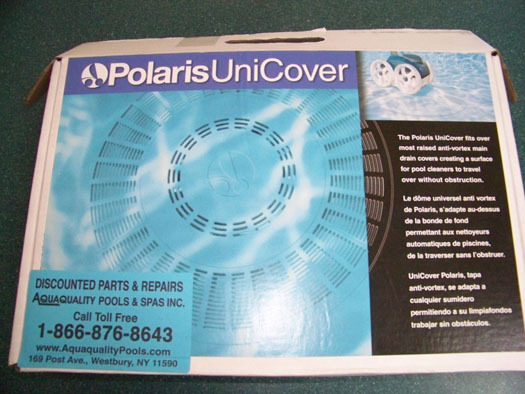 A recent buyer of this cover had this to say; "Works like a charm... Can't thank you enough"
This cover is not yet on their website but you can order from Aqua Quality Pools and Spas, Inc. by calling 1-866-876-8643. Cover is $60 + shipping. If you have 2 or more main drains and own an Aquabot or Blue Diamond/Pearl, then the second solution may be best. The second solution is a new bottom plate made for the Aquabot T2/T4. This plate has a wheel built into it that diverts it from obstruction and helps roll over everything. This part should fit all residential Aquabot, Blue Pearl/Diamond, Bravo/Viva Pool Cleaners that use plastic clips to hold the bottom plate. 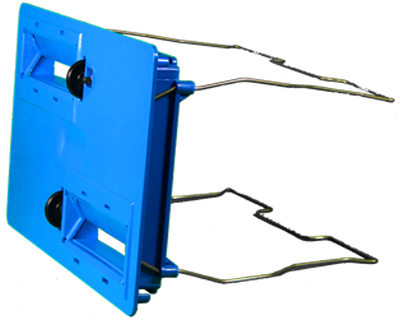 The Aquabot Turbo T-jet also has a wheeled bottom plate that will fit Aquabot bottom loading robots. Consider Wheels on Bottomplate if Your Pool Cleaner is Stuck. P/N: A9600BL. BOTTOM LID ASSEMBLY WITH WHEELS	$99.00. UPS - GROUND	$15.00. PART IS IN STOCK & READY FOR IMMEDIATE SHIPMENT. A third option was recently suggested by a visitor to this site, David. who wrote: "SOLUTION for pool cleaner getting stuck on main drain. My research led me to www.maindrainclipon.com (link opens new window)I contacted owner/inventor who is an aeronautical engineer. The clip-on worked for me!!" I have not seen or personally used the drain clip but the specifications are clearly posted. Prices seem reasonable between $18 and $60 depending on the application. If your robot has recently been getting stuck on the main drain then you may consider replacing treads and brushes. These parts may have worn down so the body of the pool cleaner sits closer to the liner and can no longer clear the top of the main drain. Last bit of advice: Turn off or reduce the suction to the main drain for as long as your robot is working. Reducing the suction just a little can make the difference between getting stuck or gliding over the main dran cover.